In the distant mists of 1995, Bobby Kotick thought a company was crazy when it acquired the small development studio Blizzard for $7 million. In 2007, he paid $7 billion. Whoops. When it comes to pure financial solvency, there are very few developers in the business that have as much guaranteed revenue as popular PC game maker Blizzard. Infinity Ward has the ridiculously popular Modern Warfare 2, Nintendo has its own stable of money-printing machines and franchises, but Blizzard has games that are still on bestseller lists despite being a decade old - and of course, Blizzard has WoW. In 2007, Activision merged with Blizzard parent Vivendi Games to form Activision-Blizzard, a merger worth a whopping $18 billion. 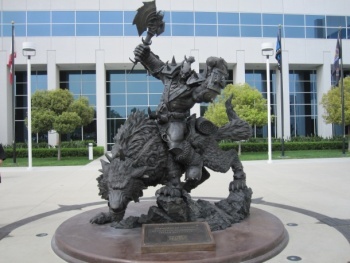 In the course of that merger, Activision ended up paying $7 billion for the World of Warcraft studio, a fact which prompted Activision CEO Bobby Kotick to relate an anecdote about how things could have gone differently between the studios to Game Informer. In 1995, said Kotick, he had been having a meal with Davidson & Associates during which it came up that the firm had purchased fledgling developer Blizzard for $7 million. The businessman in Kotick was, frankly, baffled: "That year Activision probably had 60 million in revenues. They said they paid seven million dollars for Blizzard. I'm like 'Are you out of your minds? They're like a contract developer! They have Warcraft but what else do they have? You paid SEVEN million! That's insane!'" Twelve years later, Kotick's company would pay a thousand times that for the PC developer. "I was talking to [Blizzard founder] Mike Morhaime the other day and I said, 'You know, I could have bought you for seven million and instead it was seven billion.' He said, 'Yeah, could you imagine if I had just held out for the seven billion instead of the seven million?'" I can imagine the situation would be frustrating in a rather ha-ha-funny-in-hindsight way for both Kotick and Morhaime, though for decidedly different reasons. But it's something very interesting to consider - how would the gaming landscape have changed if Activision had been the one to acquire Blizzard in 1995 for that (relative) chump change?